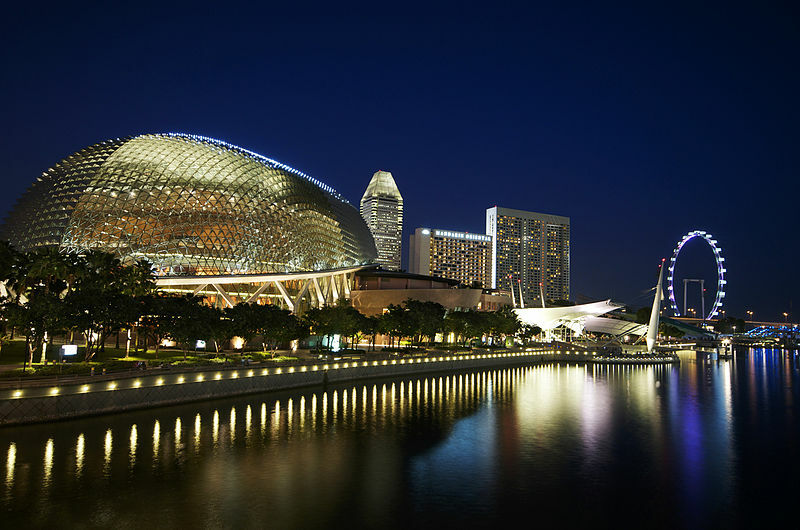 The Esplanade in Singapore is a really interesting building if you're into architecture. Therefore, when I'm eventually in Singapore, I would like to visit the building. Is there any guided tour available that tells me more about the architecture? ** Including a sneak peek at the Concert Hall and Theatre, subject to venue availability. Please note that your Identification Card or Passport is required for the loan of the PDA. You'll find loads of other tours on sites like Viator or through travel agents. IMO though the best options would be either to take the self-guided tour or grab hold of a knowledgeable Singaporean! Go around sunset, that's when the Esplanade looks the most beautiful. Personal recommendation: if you are in Singapore for a short while and are in the Esplanade area, go the Makansutra hawker stalls in the area. Sure, 'true connoisseurs' will turn up their nose but if you're pressed for time it's an excellent place to try out a variety of Singaporean cuisine. From a local's perspective, the Esplanade needs no tours. The whole Esplanade may be covered in less than a day - in fact, two or three hours. The best way to experience the Esplanade is to be there during the Mosaic Music Festival - a 10-day showcase of local and international music talents. If you're on a tight budget (some tickets are about SG$80-100) you may catch a free performance at the outdoor theatre on friday and weekends in the evening. As recommended by Ankur, you may wish to grab a bite at the Makansutra food stalls next to the Esplanade shopping mall. Currently, the Victoria Concert Hall up the river is undergoing renovation. Once completed, I highly recommend checking that out to see the contrast between colonial and modern architecture. Not the answer you're looking for? Browse other questions tagged tours guides landmarks architecture singapore or ask your own question. In Singapore, is there a weekly/monthly transit pass foreign tourists can buy?